Cornelius Bennhold, Professor of Physics and recent Chair of the Department of Physics at The George Washington University, passed on from this world on the evening of Wednesday, April 22, 2009, at the age of 48, after a long and courageous struggle against cancer. Cornelius earned his BS degree from the University of Mainz in Germany in 1981, and his PhD from Ohio University in 1987. He held postdoctoral fellowships at Mainz and then at TRIUMF in Canada. He came to The George Washington University in 1992 as Assistant Professor of Physics. 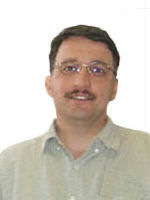 He was promoted to Associate Professor in 1998 and to Professor in 2003. He served as Chair of the Department from 2004 to 2008. His research gained support from the U.S. Department of Energy and the National Science Foundation. well-loved teacher and a valued colleague and mentor. His giving spirit led him naturally to serve the University in both tangible and intangible ways. Professionally, he was a theoretical nuclear physicist, whose work led to the understanding of several fundamental aspects of the structure of matter. He became a widely recognized expert in the physics of few-body nuclei and in hypernuclear physics. In addition, he developed a coupled-channels approach to nucleon resonances. He was often invited to give talks on his work at international conferences and major universities and laboratories. He organized and chaired several major conferences himself. He kept in close contact with the experimental nuclear-physics community as well, leading to a healthy cross-fertilization of ideas and observations. He was immensely productive: he published over 100 papers in refereed physics journals and gave over 100 invited talks. Four of his papers have been cited more than 100 times, demonstrating his influence on the field. GW recognized his accomplishments with the Trachtenberg Award for Faculty Scholarship. Even these achievements do not reflect the high regard in which he is held by theorists and experimentalists alike. His colleagues knew him as an open-minded and influential scientist with a deep understanding of underlying physical concepts. His advice and collaboration were often sought in planning and interpreting experiments at the Thomas Jefferson National Accelerator Facility and at other major laboratories worldwide. Because of his deep understanding of physics and because of the generous way in which he treated people, he was a constant source of support and encouragement, especially for young physicists. For many, he became a role model and lifelong friend. Cornelius was a superbly talented teacher, whose dedication to his educational craft was matched by his deep compassion for his students. He cared in a very personal way for their progress in learning; this was evident to his students, further motivating them to achieve objectives that they themselves might have considered unattainable. He had a knack for illuminating the conceptual side of every question and explaining it in a direct and concise manner. He was innovative in his pedagogical methodology and techniques—he was a leader in the Department of Physics for advocating active engagement in learning and for the use of technology in the classroom. His efforts were recognized by GW with the award of two separate teaching prizes—the Robert W. Kenny Prize in 1995 and the Morton Bender Award in 2007. His inspirational teaching led naturally to scholarly pursuit: the development of a novel framework for linking physics problem-solving skills with specific cognitive abilities. In fact, he was in the process of incorporating this idea into an organized classroom curriculum. His work in the area of Physics Education Research has been presented in talks and papers at various professional conferences and was approved in 2009 for funding by the National Science Foundation. In Spring 2018, the auditorium in the recently renovated Corcoran Hall was dedicated to Cornelius, now called the Bennhold Auditorium. Cornelius had a broad perspective and inspired others to think broadly. He taught GW medical students in a course on Spirituality and Palliative Care. He challenged the students to move outside the standard medical paradigm, thinking of the wholeness of each person. Because of Cornelius, there are young doctors today who listen to their patients—their stories of suffering, their testimonies of faith, and their striving to find hope in the midst of despair. Cornelius' colleagues and friends knew him for his intelligence, warmth, wit, conviction, and courage. He was a teacher's teacher as well as a fine researcher. He could inspire his students to achieve, with didactic humor and the wisdom that he developed from deep thought about the nature of the physical world and from his insightful investigation into the learning process. We all can take comfort in the knowledge that Cornelius lived a full life and that he made a major difference in the lives of many.